Draft: 2011, Philadelphia Phillies, 5th rd. 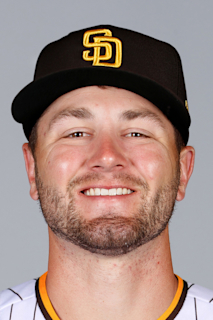 Mitchell S. Walding… 2011 graduate of St. Mary's High School (CA)… Hobbies: Golfing, fishing and hanging out with friends… Signed by: Joey Davis. Shuttled between Lehigh Valley (AAA) and the Phillies all season... Named an International League postseason All-Star...Selected as IL Player of the Month for July...Led the IL with 73 walks, ranked 3rd in OBP (.390) and 5th in SLG % (.474)...Hit .265 (103-388), 20 2B, 2 3B, 19 HR, 69 RBI, 70 R, 73 BB, .390 OBP, .474 SLG % in 119 games with Lehigh Valley... Made 104 starts at 3rd base and 3 starts at 1st base for the IronPigs... Made his ML debut, 5/30 at LAD, in a start at 3rd base after having his contract selected earlier that day...Drew his first ML walk on 6/22 at WSH... On 9/14 vs MIA, collected his first ML HR (and hit) in the 8th inning (Bryan Holaday); it snapped a 0-for-14 stretch to begin his career...Became the first Phillie to hit a HR for his first career hit since Brock Stassi did so on 4/10/17 vs NYM. Played the majority of the season with Reading (AA)...Selected as an Eastern League midseason All-Star...Finished 3rd in the EL in HR ratio (HR/14.04 AB), 4th in HR (25) & SLG % (.516) and 6th in OPS (.842)... Named Phillies Minor League Hitter of the Month and MiLB.com EL Player of the Month for June...Batted .337 (31-92) with 4 2B, 2 3B, 13 HR and 27 RBI in 25 June games...His 13 HR in June were most among all minor leaguers in the month and tied with LAD's Cody Bellinger for most in affiliated baseball; only Giancarlo Stanton (18 HR in August) had more HR in a calendar month among affiliated players...Selected as Phillies Minor League Player of the Week, 6/26-7/2...Was on the DL, 7/26-8/23, with a concussion; included a rehab assignment with Gulf Coast League Phillies (R)...Finished the season with an active 10-game hit streak... Played for Los Mochis in the Mexican Pacific Winter League. April 20, 2019 Philadelphia Phillies recalled 3B Mitch Walding from Lehigh Valley IronPigs. March 15, 2019 Philadelphia Phillies optioned 3B Mitch Walding to Lehigh Valley IronPigs. September 8, 2018 Philadelphia Phillies recalled Mitch Walding from Lehigh Valley IronPigs. July 25, 2018 Philadelphia Phillies optioned 3B Mitch Walding to Lehigh Valley IronPigs. July 20, 2018 Philadelphia Phillies recalled Mitch Walding from Lehigh Valley IronPigs. June 25, 2018 Philadelphia Phillies optioned 3B Mitch Walding to Lehigh Valley IronPigs. June 20, 2018 Philadelphia Phillies recalled Mitch Walding from Lehigh Valley IronPigs. June 6, 2018 Philadelphia Phillies optioned 3B Mitch Walding to Lehigh Valley IronPigs. May 30, 2018 Philadelphia Phillies selected the contract of Mitch Walding from Lehigh Valley IronPigs. January 3, 2018 Philadelphia Phillies invited non-roster 3B Mitch Walding to spring training. November 15, 2017 Caneros de los Mochis placed 3B Mitch Walding on the reserve list. November 4, 2017 Caneros de los Mochis activated 3B Mitch Walding. October 29, 2017 Caneros de los Mochis placed 3B Mitch Walding on the reserve list. October 4, 2017 3B Mitch Walding assigned to Caneros de los Mochis. September 6, 2017 3B Mitch Walding assigned to Lehigh Valley IronPigs from Reading Fightin Phils. August 24, 2017 Reading Fightin Phils activated 3B Mitch Walding from the 7-day disabled list. August 22, 2017 Reading Fightin Phils sent 3B Mitch Walding on a rehab assignment to GCL Phillies. July 26, 2017 Reading Fightin Phils placed 3B Mitch Walding on the 7-day disabled list. Ear fracture. August 4, 2016 3B Mitch Walding assigned to Reading Fightin Phils from Clearwater Threshers. July 31, 2016 3B Mitch Walding assigned to Reading Fightin Phils. April 6, 2015 3B Mitch Walding assigned to Clearwater Threshers from Lakewood BlueClaws. April 29, 2014 Lakewood BlueClaws activated 3B Mitch Walding from the 7-day disabled list. March 30, 2014 Lakewood BlueClaws placed 3B Mitch Walding on the 7-day disabled list. September 18, 2013 Lakewood BlueClaws activated 3B Mitch Walding from the temporarily inactive list. August 22, 2013 Lakewood BlueClaws placed 3B Mitch Walding on the temporarily inactive list. March 30, 2013 3B Mitch Walding assigned to Lakewood BlueClaws from Williamsport Crosscutters. August 15, 2011 Philadelphia Phillies signed SS Mitch Walding.